Popular mobile security app Lookout introduced a new feature today called Theft Alerts, aimed squarely at helping catch thieves in the act. The concept is simple: Whenever someone tries to access your phone without permission – say by inputting a bad password – Lookout will use your phone’s camera to snap a photo of the perpetrator (without his or her knowledge) and email it to you, along with a GPS map showing the phone’s location. You can see the new feature in action in the short promotional video below. There are five specific actions associated with thieves that will set off a Lookout Theft Alert: inputting a bad password, removing the SIM card, enabling Airplane mode, turning the device off and removing Lookout as a device administrator. Of course, you’ll routinely perform many of these actions yourself, so most of Lookout’s so-called “theftie” selfies will be awkward pictures of you. There’s no guarantee that Lookout’s new Theft Alerts will catch a crook in the act – a smart thief could easily place his or her thumb over the camera to get around the feature. Still, with smartphone theft on the rise and so few stolen phones ever getting returned to their owners, anything that boosts your odds of recovery is a good thing, especially if it might take a bad guy off the streets. The Lookout Mobile Security app comes pre-installed on most current AT&T devices, and is otherwise available on the Apple App Store for iOS and on Google Play for Android. 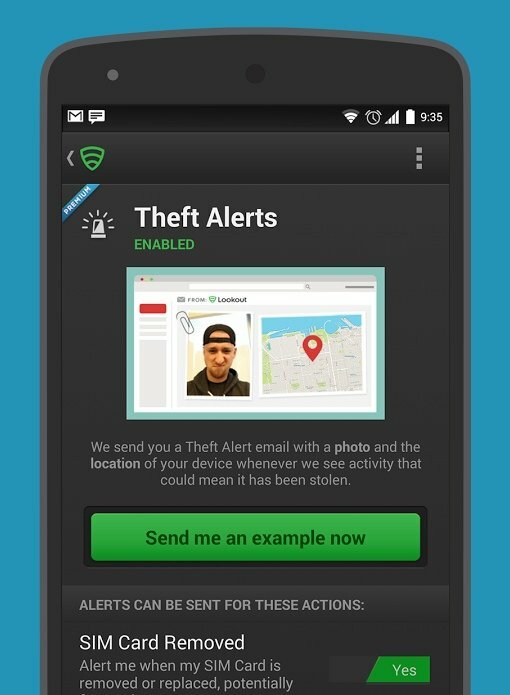 The app is free to download and use, though Theft Alerts are a premium feature that will require a $3 per month subscription to Lookout Premium. For other anti-theft apps and services to help keep your phone safe, check out our need-to-know guide to mobile security.